We had a truly wonderful wedding day thanks to Petra. She helped us choose the best venue, arranged all the paperwork, and kept in regular contact in the run up to the wedding with lots of great ideas. Petra also knows fantastic people. The flowers she had organised were gorgeous, and the photographer’s pictures captured not only how much we loved our wedding day but also the stunning setting and scenery. The cake was delicious as well! Whatever we hadn’t thought of, Petra had, like the little cushion for holding the rings and some fizz for after the ceremony. Although we got married away from home in beautiful Kranjska Gora, Slovenia, we had our new fun and very kind friend Petra with us. Thank you Petra, for our perfect wedding day. From Petra’s very first email she came across as caring, knowledgeable, enthusiastic and funny. We had a tiny wedding, but Petra never once made us feel as though our occasion was less important than the huge weddings that she also arranges. Even though we worked off Petra’s basic package it felt like the whole event was tailored to us. Petra is an absolute font of information and is clearly well-known around Bled – it can take a long time to walk anywhere with Petra as everyone is always stopping her to say hello! She went above and beyond to ensure that during our time in Bled we stayed at and ate at places that we would enjoy. However, even after we had left Bled, Petra was still our most important resource in Slovenia – telling us places she’d personally visited and loved. Because of her flexibility, knowledge and attitude we got our perfect wedding which was pulled off seamlessly – and as far as we’re concerned we got to share our day with a wedding planner who’s still excited about what she does, who cares about how you’re feeling and who runs around after you on the big day carrying everyone’s handbags, coats, formal documentation and cameras with a big smile plastered on her face. 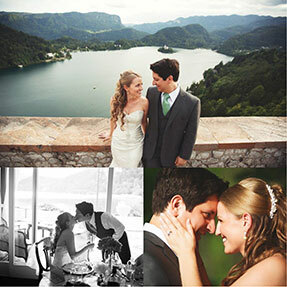 If you are planning a wedding in Slovenia then we genuinely couldn’t recommend Petra highly enough. Congratulations! And we hope that you have an incredible experience knowing that you’re in safe and professional hands!! Dear Petra, thanks again for all your help and everything you did to ensure our wedding was a success. Everything was great, from the weather to the food to the venue. Taja and the hotel staff at Toplice and Kompas were accommodating and helpful. All of you who think you know how much work it takes to organise a wedding, let us assure you: you have no idea! There are really so many details and there is so much coordination that it’s simply impossible to foresee everything. We were lucky to have a wizard in this field – Petra. She arranged everything for us, thought of everything and in the end managed the whole protocol, so that everything ran smoothly. Thank you so much Petra! Your wedding is a special day where everything should run perfectly. At our wedding, everything went as we had imagined. Petra’s help was indispensable, as she reminded us throughout of details that had to be taken care of and we had completely forgotten about. It is easy to make a framework for your wedding (to picture what the wedding should be like), but later things can start getting complicated over the seemingly least important issues. Petra was very relaxed, while at the same time being very professional. She has an exceptional sense of aesthetics. This is why our wedding was really like a fairytale, very elegant and it is no exaggeration to say that we were like in a film that Petra helped to direct. It was obvious that she cared very much that we had fun, that we enjoyed our special day and that everything ran as we had dreamt, and this meant a lot to us. It was nice that we continued to see each other after the wedding, looked at the pictures together and that is when you can see that somebody has put her heart into organising such an event. Petra really stood by our side, so thank you once again for the effort you put into our wedding. 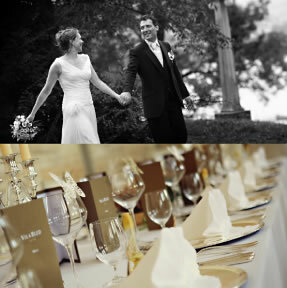 Dear Petra – We would like to thank you from the bottom of our hearts for the excellent organisation of our wedding. 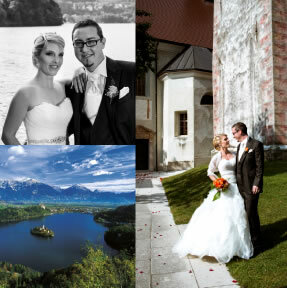 It was a challenge for us to organise our wedding in Bled as we live in Switzerland. This is why it was very important to us to have a competent and trustworthy person with local knowledge on the spot. Your professional and warm-hearted manner convinced us from the very first visit. Thanks to your many great ideas, we were able to celebrate a wonderful dream wedding which will stay in our memories forever with guests of two nationalities. Dear Petra… without you, none of this would have been possible. 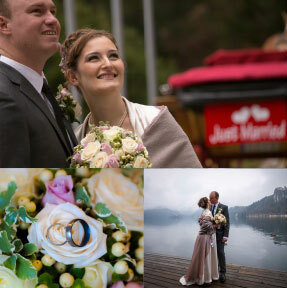 You made our ideas of a dream wedding come true and we are looking forward to a toast with you soon in Bled with a glass of Bjana. Dear Petra – a big Thank You for organising our wedding day! Throughout the entire preparation which took a few months, we were able to rely on your professional approach and have trust that our big day will unfold perfectly. You managed the whole team successfully, ensuring that the venue and decorations charmed everyone, the wedding dinner was delicious and talked about long after the wedding day, and the many small tasks behind the scenes required for the success of the whole day were done flawlessly. Without hesitation, we strongly recommend Petra’s organisational skills, passion for perfection and her professionalism to anyone, who wishes to have a peace of mind on their wedding day. Petra’s organisation and attention to detail is perfect. She enabled us to plan a wedding from a different country without having to worry about any aspect. Petra has a good understanding of how to make the day special and her knowledge of good food and good wine is outstanding. When we planned our wedding with her, she always responded to emails in good time and when we would meet to discuss the day she made us feel so welcome and very special. Petra allowed for us to have a perfect day! 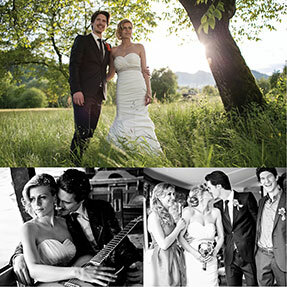 Sarah and Chris’s wedding was organised by Petra as hotel manager and Primavera Bled as wedding planners. Petra was extremely helpful in terms of the support in organising our wedding… We were so impressed by the personal service she provided, and the flexibility she had in terms of meeting our exact needs (and I was a fussy bride!). The wedding felt so personal, like we were able to add our personal touches to each part the day. Petra and her team met absolutely every requirement we had. I could literally write for hours about how perfect the day was. The wedding was absolutely ‘out of this world perfect’ like a real fairytale, all of our guests could not praise Petra and the team enough. Everyone was so impressed and commented that it is was like no other wedding they had been to. I want to thank Petra for creating perfect memories for us that will last us our lifetime… and this is something which is priceless. I would have no hesitation in recommending Petra and would be absolutely confident that she will go on to make more fairytale memories for many other lucky couples to come. Laura and Tony’s wedding was organised by Petra as hotel manager and Primavera Bled as wedding planners.